My vintage gear is in use every day. I find I enjoy the sound of the old vintage stereo equipment much more than I do the newer equipment. My set up includes a Pioneer SG-9500, SR-303, RG-2, CT-F1250, a Teac A-4010GSL ( all rack-mounted ), a Pioneer SX-1980, pair of Pioneer HPM-150's, pair of Pioneer HPM-1100's, pair of Pioneer HPM-900's, a Sansui AU-111, a Technics SL-5100 with a Shure M95HE, a Teac A-4010S. Also have a midi set-up consisting of a Yamaha YPG-625, Korg Poly 800-II, Casio CT-640, Behringer Eurorack EB1204-Pro, Roland TR-505, Roland MPU-105, E-Magic midi-USB interface and a Pioneer A-5 for a monitor amp. I've owned and used all of this gear since new in the 60's and 70's, except for the more recently acquired midi stuff. Real nice, real nice! Pioneer SX-1980, that one is really taking me back!!!!!!!! 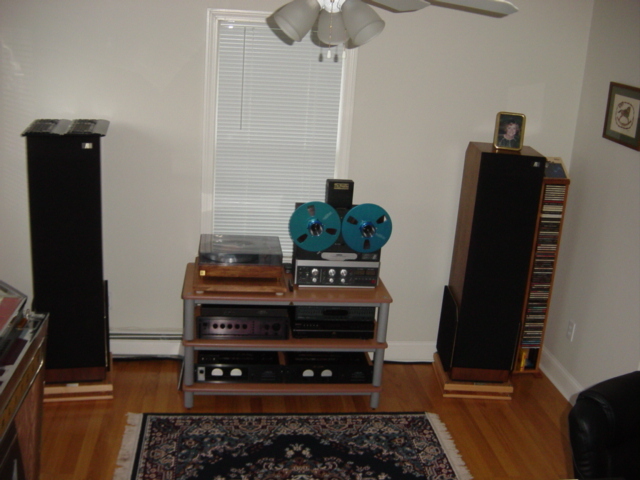 I have a pair of Sansui SP-X9000's that can still put on a great vintage performance. I mean c'mon! they are almost 3x as old as I am! Over the last year I've started building my two channel system back up. I've had a set of Acoustic Research AR9 speaker since the early eighties when they first came out. I just finished re-foaming them and replacing all the caps in the crossover. I can't believe how good they sound again! Another thing I found that also made a huge improvement in the sound was putting them on a "Isolation Base". I got the idea on another forum where they were talking about isolation for speakers. They crank some serious bass! I replaced my Carver TFM 25 amp with two Carver TFM 45 amps. (Got the amps of the bay) I've sent one so far to Rita at Rita's Carver repair center for a tune up. Rita used to be the head technician at Bob Carver's Sunfire Company. Bob himself stops by the shop periodically and signs equipment that's in for repair. He signed mine! I'll be sending the other one back soon for a tune up too. Hopefully Bob will sign that one too. Each speaker is vertical bi-amped with a TFM 45. Plenty of power with these babies. I also replaced my Carver C-4000 preamp with a Carver C-19 preamp. What a beautiful sounding piece of equipment. This preamp has TUBES in it. I have a couple hundred LP's and bought a new turntable a few months ago. Technics SL-1210M5G. it's a beautiful looking turntable and sounds great. But to be honest it didn't have the sound I remember getting from my old AR XA turntable. So again I bought a AR XA turntable from the bay and just finished rebuilding it. ahhhhhh..... that's the sound I remember! This turntable is about as plain Jane as it gets! It's using a AT 440 MLa cartridge. 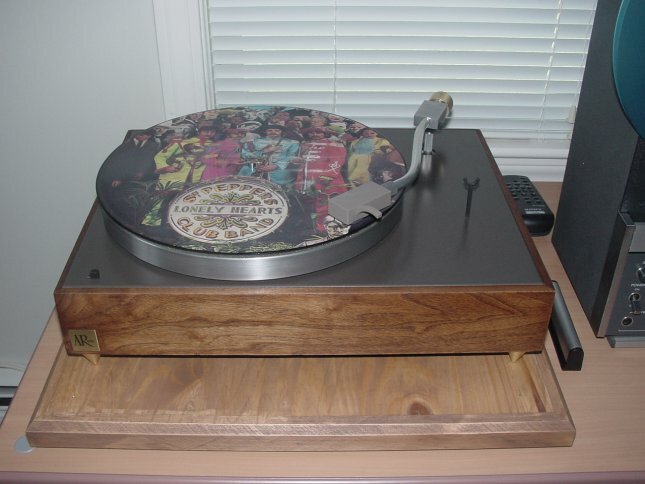 Attached a pic of my setup and the AR XA turntable. I wasn't aware of biased crossovers and unfortunately I'm not going to be ripping them apart again anytime soon. Thanks for the idea PT800.....someday I might certainly try it. Actually the isolation bases aren't foam. There two pieces of wood with roller bearings in between. I swear they have greatly improved the dynamics of the speakers. deacongreg, you are right......AR9's can't get enough power! Using a TFM 45 vertically bi-amped for each speaker gives a total possible 1000 watts! 500 watts for the woofers and 500 watts for the uppers. Thats what I`m talkng about, turn it up!!!!!!!!!!!!!!!!!!!!!!!!!!! In my bedroom I run a Sherwood S-7200 receiver driving a pair of B+W DM23 three way speakers. The source is a Onkyo R%1 Integra CD player. G`day all. I have had,and still own many vintage (or near enough ) vintage hi fi components to warrant an post. Such things as two Ariston RDII turntables (in pieces,awaiting a rebuild ), a Denon DA-401 lightwieght tonearm,a Denon AU-401 moving coil transformer, and most (some ? ), of a pair of John Bowers Active One speakers rebuilt as passives with Scanspeak drivers (sound sublime ). Also an Conrad Johnson PV-7 valve pre-amp ,an highly desirable Marantz DA-12 digital/anologue converter as well as JBL and Celestion speakers,the last of which reside in the homes of close relatives. Love the pleasure and passion these pieces of " old kit " have given over so many years.